Vincent Power Cycles such as this are quite rare nowadays. The Vincent Firefly was only manufactured between 1953 to 1956. In the first year it was supplied as a cycle-attachment engine kit only. When fitted to a specially made Sun bicycle, in 1954 and 1955, or this type of Phillips frame in 1956, it was known as a Vincent Power Cycle. I sold this one in 2009 (it went to an enthusiast in Australia) and have added it here as a database record. Vincent ceased production of their big motorcycles in 1955. So, actually, a Firefly unit fitted to this Phillips frame as a Vincent Power Cycle would have been one of Vincent’s final machines. The Firefly was marketed at the same time as Vincent imported and sold the NSU Quickly. The Quickly was so successful that Firefly sales suffered as a result. It was a well-built machine, and still very useable over 50 years down the road. These days the model is highly sought-after by Vincent afficionados and cyclemotor enthusiasts alike. See the Phillips pedal crank (below). 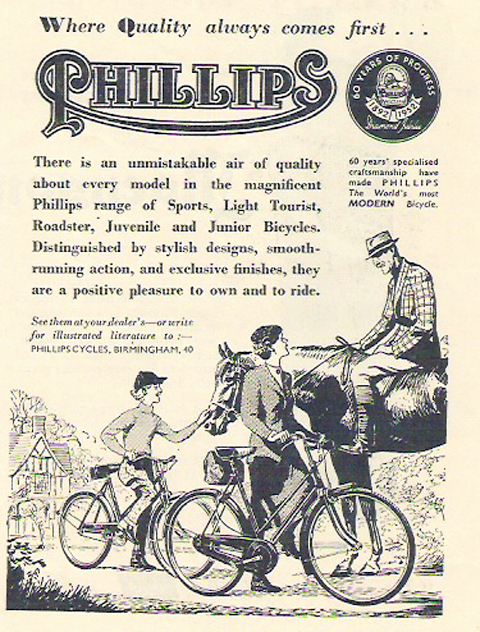 Below you can see the Phillips Motorised Bicycle. 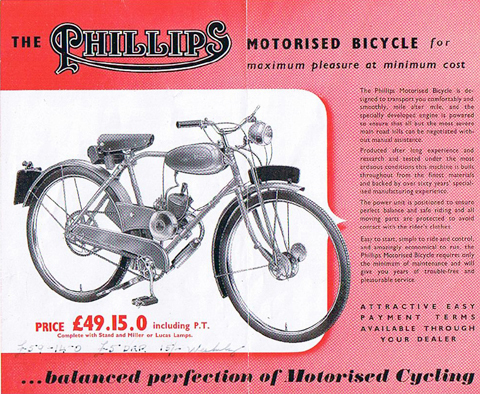 Phillips sold this as a complete machine (though the cycle parts are the same as used on their ordinary bicycle). The frame is the same as that made for the Firefly. Below, you can compare it to the ordinary Phillips cycle. 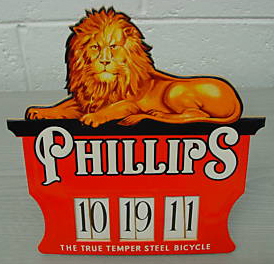 The handlebars are genuine Phillips. Saddle is a Brooks B73 in good (weathered) condition. Wonderful thing, the internet. I did a search today on Vincent Firefly and, hidden among the usual guff was this little gem from 1915: Helen Vincent’s My Pretty Firefly. I wonder if the song influenced Philip Vincent when it came time to name the company’s cycle-attachment engine in 1953?